What is a career fair (sometimes also called a job & internship fair) and what should I expect? 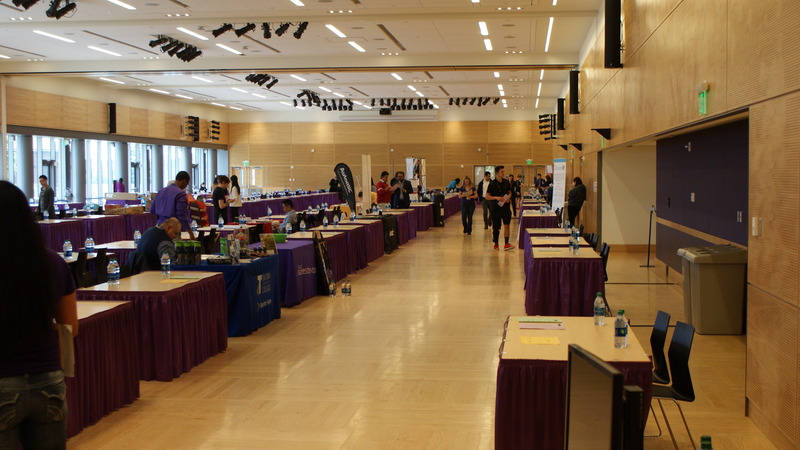 A career fair is an opportunity for employers interested in hiring UW students and alumni to come to campus and meet face-to-face with potential candidates. Career fairs are a great way for students to meet representatives of companies they are interested in learning about or working for. At a career fair, each registered employer gets a booth or table. They stand at that booth or table and talk with interested students and alumni who wish to learn more about the company, or are interested in submitting an application for a specific role. There are often lines to wait to speak with representatives of a company. An interaction with an employer at a career fair is often no more than 2-3 minutes, and is a chance for introductory conversation, for you to express your interest in the employer, and often for you to share with them your resume. Employers may have a request for action, such as applying online or emailing them directly after the fair but, often, submitting your resume at the fair is all that’s required for additional consideration. This will vary from employer to employer, and you can follow the lead of the employer representative with whom you are speaking. 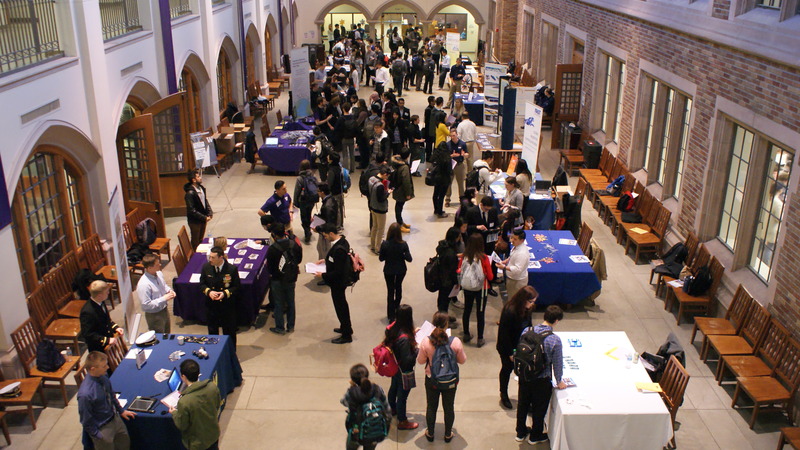 Examples of career fairs include the Winter Job & Internship Fair; the Marketing and Communications Job & Internship Fair; the Spring Job & Internship Fair; and dozens more across campus in any given academic year. A complete list of career fairs can be found on our website. What does a career fair look like? 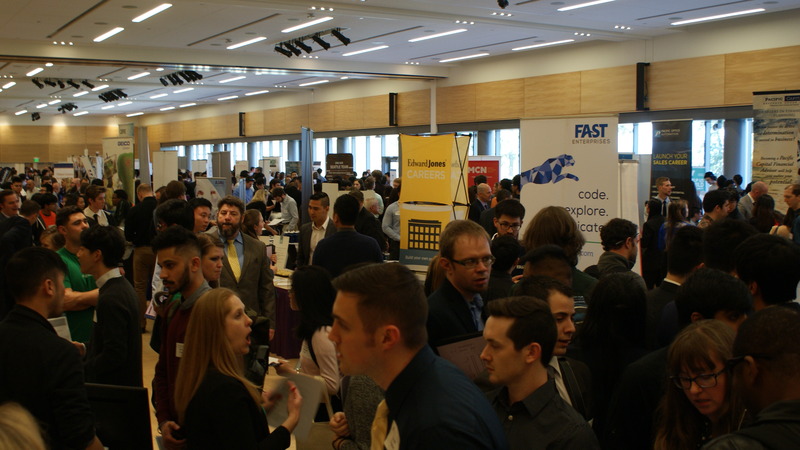 Career Fairs can be hosted in a variety of campus locations, but are most typically hosted in either the Mary Gates Hall Commons or the HUB Ballrooms. How do I know which employers will be there, and where they’ll be physically located in the event space? Each career fair has a map created in advance, highlighting the employers in attendance and their physical location in the venue. An example of a past career fair map can be found by clicking here. Many career fairs also utilize an app or web-based tool like Handshake to share information on attending employers, which allows you to view information about their companies and hiring needs before you arrive at the fair. Depending on which representative from a company is at a particular fair, they may or may not be representing or able to speak to all job or internship opportunities at their company. Depending on when you arrive at a career fair, and how many students are already in the venue, you may need to wait in line in order to gain access to the career fair room/space. How should I prepare for a career fair? We offer both in-person and online workshops on how to succeed at a career fair. Plan to dress business casual, and bring multiple copies of your resume – enough to give to the employers you already know you’re interested in, and extras that you could distribute if you discover other employers that interest you. Know you can take a breather if you need one. Exit/re-entry is allowed at most campus career fairs, so if you need a moment to collect your thoughts, catch your breath or plan a strategy for the next round of tables you’ll visit, feel free to step outside. What if I need assistance or support in navigating a career fair? We are committed to helping all students successfully engage with employers. Students with disabilities who anticipate challenges effectively navigating a career fair environment, with or or without the support of DSO (see below), are encouraged to reach out to us in advance at careerevents@uw.edu.